Who remembers the cat scene in The Matrix? The scene depicted Neo, Morpheus & the other good guys convinced that they had already witnessed or experienced a certain situation. What do we usually call this experience or state of mind? 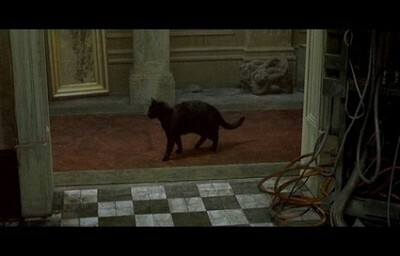 Unlike the most cases of a déjà vu where no determination can be made as to whether the circumstances of the previous encounter were imagined or true, in that particular scene from The Matrix the cat indeed passed the door twice. The good guys instinctively felt that something was wrong. And their feelings did not betray them: something was wrong indeed! In a previous blog post I did already compared the laws on data retention with the bad guys’ attempt to maintain total control in The Matrix. When I recently read that the Austrian data protection council had again disfavoured the then current bill on data retention in a critical statement, it felt like a déjà vu to me. What does the council criticise? 1. The council has some very serious doubts as to data retention bill’s compatibility with Art 8 of both, the European Convention on Human Rights and the Charter of Fundamental Rights of the European Union. 2. While the council acknowledges that law enforcement authorities should be equipped by sufficient powers in order to fight organized crime and that access to communication data might be helpful in such context, it opines that such powers must be applied only to concrete occasions and be subject to specific controls. 3. The council further urges the European Commission to eventually conduct the evaluation owing to Article 14 of the Directive 2006/24/EC. 4. In the event that Commission’s evaluation results in a review of the data retention Directive which recommends the implementation of lesser onerous measures, the council suggests that the legislature opt for the so-called quick-freeze procedure. The latter recently gained a measure of popularity because of its submission to public debate in Germany. 5. Last but not least and given the “informative value” of retained data, the council calls upon the legislature to maintain the highest possible data security standards when transposing the Directive. Will this statement halt the transposition of data retention in Austria? Unfortunately, it will not, because the data protection council has advisory and, hence limited, powers. Its statement is nevertheless significant – it once again makes it very clear that data retention is at odds with fundamental human rights, and that the politicians are very well aware of this fact. What can a single individual do? First of all inform yourself and inform others who are not yet familiar with data retention. And since data retention is considered avoidable – learn how to either avoid it or make it appear obsolete. Did I miss an important point? What else would you suggest? Did you find this article informative or helpful? If yes, do not forget to share it by pressing one of below buttons or to otherwise tell your friends about it! Europe’s Last Stand Against Data Retention? Do you remember Morpheus saying “Wake up Neo… The Matrix has you!”? Do you remember Agent Smith implanting an electronic tracking bug in Neo’s body? I bet you do, because the image transported by this film does not appear that fictional anymore. It may be just an arm’s length away. What is data retention and its purpose? Data retention in the sense of the Directive 2006/24/EC provides for the storage data arising out of telephone calls made and received, emails sent and received and websites visited. Since location data counts to traffic data, it is collected too. The introduction of data retention has always been justified with combating terrorism and serious crimes, but it aims to fight file-sharing users instead. Owing to its controversy, legislation produced by transposition of the data retention Directive has been contested in some EU member states. While Ireland challenged Directive’s compatibility with formalities under the then current EC Treaty, the constitutional courts of Romania and Germany were asked to deal with data retention’s compatibility with fundamental human rights. As a consequence, the respective provisions got abrogated, but not annulled. Until recently, Austria managed to postpone the transposition of the Directive 2006/24/EC into its national law. Well, the ostensible resistance grounded on discrepancies between the two coalition forming parties rather than on human rights deliberations. However, some weeks ago the farce went to an end and a bill amendment to the telecommunications act was nodded through the council of ministers prior to its submittal to the parliament. Reportedly, the bill is being heavily discussed among the members of the parliament justice committee. The result will be, despite all assurances, the total control of communication. Now that Austria will no longer be a safe harbour in terms of privacy, are there any other member states that still have not implemented the data retention directive? Can you imagine: the Swedes usually known for their discipline and law-abiding behaviour are now obstructing the implementation of Directive 2006/26/EC. It seems that an arrangement among the Left Party, the Green Party and the Swedish Democrats managed to apply a procedural loophole in order to delay the transposition for at least a year. As I previously mentioned, the data retention directive has been referred to a judicial review a few times already. These reviews’ action items towards legislation always read the same: improve! In this respect, it is likely that the Court of Justice of the European Union delivers a judgment dealing with data retention’s compatibility with fundamental human rights under the acquis. I still have hope that this madness will come to an end. Not only because hope springs eternal, but because anyone can make an effort and engage in lawfully fighting data retention. At least anyone who cares about fundamental human rights. And if Sweden should fail, then it could be us as individuals who form Europe’s last stand against data retention! Well, some have always suspected what Austria’s Die Presse has recently reported thereby quoting an official. The gentleman in question is Christian Pilnacek who is the Head of the Criminal Procedure Department within the Austrian Ministry of Justice. When asked by a journalist, he confirmed the information, according to which the data retention provisions’ applicability should not be limited to only so called “serious crimes”. The latter is, by the way, what the Directive 2006/24 requires. It has been said that this idea has originated in the Ministry of Justice and has found support in the Ministry of Interior. Moreover, in the officials’ view retained data should be accessible in the prosecution of minor crimes and/or in dealing with civil wrongs and hence would perfectly fit in the scope of the provisions conveyed by the Enforcement Directive. Now the show is over. Seemingly, the entertainment business’ lobbyists have done a good job for their clients. See whether the idea shall prove capable of gaining a legislative majority. The Data Protection Council is an advisory body within the Austrian Federal Chancellery’s administration. In a recent session the Council debated on the newly presented bill on data retention and passed an opinion to the government. The authority’s chair publicly presented the opinion’s upshot: the bill conflicts with Articles 8 and 9 of the ECHR, hence the Council moves for a balance between the privacy right of the persons concerned and the public interest to maintain security and order. The Council further calls for a restrictive definition of a “serious crime” in order to achieve the data retention directive’s goal to fight organised crime and terrorism. The Council seems to carefully observe the international, in particular the European, development on data retention. This is mirrored in Council’s recommendation to await the inauguration of the new European Commission and the enactment of the Stockholm Programme, which, given a sufficient consideration to certain privacy aspects, may lead to the data retention directive’s annulment. I personally share that view and strongly hope for the Council to be proved correct. Austria’s DerStandard informs that the data retention bill to amend the existing Austrian Telecommunications Act was in place. In a consultation procedure, the responsible minister Doris Bures has called upon the appraisal of the participants (eg regional authorities, chamber for commerce and industry, trade unions). She thereby vowed to apply “the highest standards under the rule of law” in drafting the bill. Austria has not implemented the data retention directive yet, wherefore the European Commission threatened the government with the launch of infringement proceedings. Austrian politicians have used the data retention related set of problems in their last election campaign in 2008. For some period thereafter and, since the subject matter is highly controversial, no one appears willing to cease the delay in implementation. Quite often, the enforcers of intellectual property rights have been viewed as the real beneficiaries of the data retention becoming a fact. Many of their lobbyists and legal representatives utilized the duration caused by the governmental delay in addressing the public and stating the necessity to access retained internet traffic data that evidences, for instance, illegal file sharing. However and given an implementation, it is still unclear as to whether such enforcers shall have access to data so retained. According to recent cases on file sharing, Austrian courts seem to opine that file sharers’ interest in the protection of their traffic and identity data outweighs the enforcers’ interests to access such data. It is clear that the data retention could easily change the so established balance. I hope to soon have certainty on that. Austrian Supreme Court holds that ISP is not obliged to provide copyright enforcer with file-sharing user’s data. than a copyright enforcer’s right of information. The Supreme Court had to deal with a case where a collecting society requested an ISP to disclose the personal data of a file-sharing user, whose IP address the collecting society had already obtained. which found the defendant ISP liable to provide the claimant collecting society with the requested information. The decision is considered to have a certain signalling effect.